Update, March 2019: We’ve added lots of features and made significant improvements and updates since this announcement. 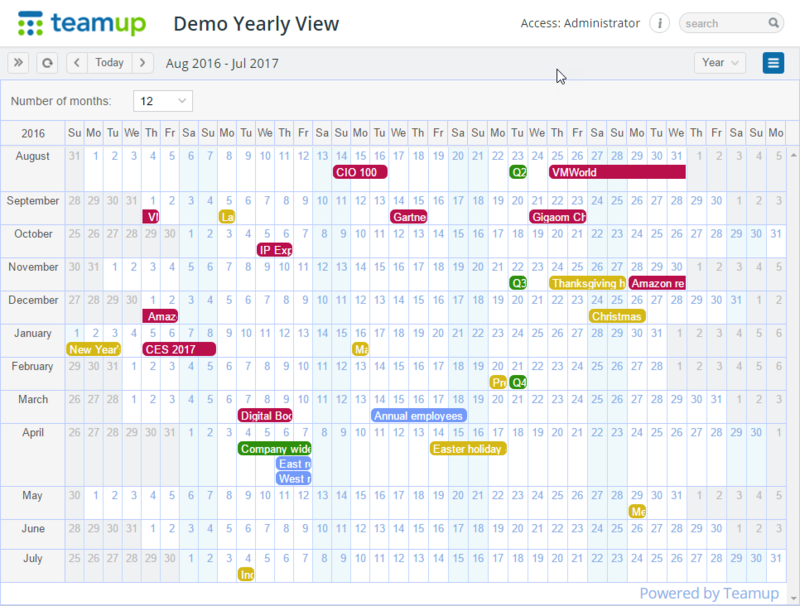 Read the latest on our blog, check our monthly updates, or create your own free calendar to find out what Teamup can do for you! We have just made another frequently requested feature live: The yearly view. The yearly view allows you to get a bird’s-eye view of your long term planning, quickly spot when there are activities planned or availability of resources. And if necessary, drag and drop events to change plans. Append ?view=y to your calendar URL to see how your calendar looks like in the year view. Or try a live demo calendar in the year view. To make the new year view as an option accessible in the top right corner, the calendar administrator must first enable it in Settings > Calendar Views. If you are not an administrator, simply use the link parameter as mentioned above to change your calendar views at any time. If you need to start at a different month, click the arrow left or right in the small date picker calendar in the top left corner, click any date in that month. click the month name on the left to go to the month or switch to another view in the top right corner. Noteworthy is that the height of each month grid will be automatically expanded if there are multiple events on any specific date and you may scroll to view the entire selected time range. This is an improvement over the current month view where the screen height of the full screen is equally divided by the number of weeks on display, resulting in +n events not directly visible sometimes.